Biden, Boehner, Kasich, Obama: Who Would Be Most Fun To Golf With? : The Two-Way The four politicos will have a golf summit on Saturday. What if you could tee it up with one of them? Biden, Boehner, Kasich, Obama: Who Would Be Most Fun To Golf With? "When the most politically powerful foursome in America tees off on Saturday, they will not play the most notable round of golf in the Washington, D.C., area. Congressional Country Club in Bethesda, Maryland, which is just beyond the District Line, is home to this year's U.S. Open, and on Saturday, it'll be time for round three. "But if most of the world's golf fans are following the likes of Bubba Watson and Angel Cabrera, only the foursome of Obama, Biden, Boehner and Kasich — Republican governor John Kasich of Ohio — will make the political columns." 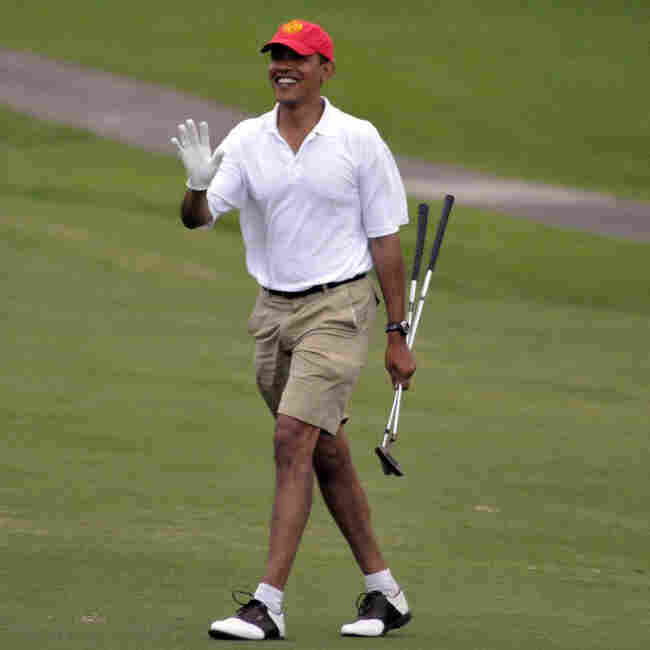 Dec. 29, 2008, file photo: Barack Obama (then the president-elect) golfing in Hawaii. Yes, there's a golf summit on Saturday, when Team Democrat (President Obama and Vice President Biden) will tee it up with Team Republican (House Speaker John Boehner and Ohio Gov. Kasich). Robert explored the question of whether anyone would want to watch the politicos play golf. Golf Digest editor Peter Finch said he would. But we think the more interesting question is: which man would be the most fun to be with? There are arguments for each, of course. -- The president: How many chances would you ever have to say you played with the commander in chief? -- The vice president: Imagine the stories he would tell. And tell. And tell. -- The speaker: He's tended bar. So he knows how to listen. -- The governor: Not as well known as the others, but high-profile enough to get you a good tee time.